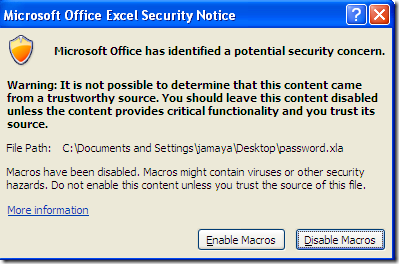 Can’t open password-protected Excel files? How many times has happened that you set a password on an Excel spreadsheet or workbook and then you forget about it? or worst, the person that set up the password on the spreadsheet no longer works with you, and you have a spreadsheet that can’t modify. what do you do? easy, use Excel Password Remover. Note: Excel Password Remover can’t be used to remove password set to open a spreadsheet. If you are unable to open the file because it asks you for a password, this program won’t help you. Then you need to get our Excel Password Recovery program to crack the file open password. Excel Password Remover is a program to remove the password to be able to modify an existing password protected workbook or spreadsheet, with that in mind let’s proceed on how to use it. Download Excel password remover from this link. Unzip the download file, there are two files: password.xla and password_2007_2010.xlam. password.xla is designed to remove MS Excel 97/2000/XP/2003 passwords while password_2007_2010.xlam is for removing Excel 2007/2010 passwords. If you get a different message, probably you need to lower your security settings on your Excel. If your current settings are high, set them to medium. After you get the pop-up, on Excel go to Tools, and click on Unprotect workbook and Unprotect sheet. That’s it, your Excel workbook or spreadsheet should be now unprotected. Hard drive passwords block access to all the files stored on the hard disk in your computer. They offer great security without having to install any software, without having to learn much, without having to spend a nickel and at the minor nuisance cost of entering a single password when turning on your computer. They are more secure than operating system passwords or BIOS-resident power-on passwords. Hard drive passwords only comes into play when a computer is turned on. To begin with, not all computers offer hard disk passwords as an option. To see if it’s available, you have to get into the BIOS setup/configuration program and poke around. If it’s there, it will probably be in a “Security” or “Password” section. In a corporate environment the home office techies should have set the Master password which allows them access even when employees forget their User level password. Outside of a corporation, you should be able to set both the Master and User passwords, in effect, giving you two passwords. Remember either one and you’re fine. I say “should” because the Acer Aspire One only allows you to set a single password. In contrast, ThinkPad lets you set both User and Master passwords. If multiple users in a household share a common computer they would all need to know the hard disk password. The only protection provided in this case would be if the machine was stolen. Do not forget your hard disk password! Keep it in a safe place. If you forget your hard disk password, there is no way to reset your password or recover data in the hard disk drive. Neither an IBM authorized reseller nor IBM marketing representative can make the hard disk drive usable. In the event that both DriveLock passwords are lost, the hard drive is rendered unusable . . . There is no “back-door” that can be used to unlock the drive if both passwords are lost. There is no way to bypass the security password feature of Hitachi hard disk drives. If the password is not known or has been misplaced, Hitachi will not be able to assist in gaining access to the data on the drive. So you should know how secure the hard drive passwords are. Never forgot the hard drive password you set until you know exactly how to hack a hard disk password. Most of us have private data. Not all of us have a private computer to keep that data. So, we just end up with other people viewing that data. Although password protecting software do work, it is almost useless to hide private data with these software (because we are always questioned as to what it is that we are hiding with the help of these software). Hidden folders do not work as they can be easily searched with Windows Search. So, we need an alternative way to create hidden password-protected folders which only we can access. And that is exactly what we will learn in this post. With this trick, you can create a secure password-protected folder in Windows which no one except you can access. To use this trick, please click here to download a self-extracting file and save it to your desktop or other location. Uncompress the .zip file, you’ll see the batch file: protectfolder.bat. 1) Double-click on the batch file. A new folder will be created. 2) Copy your personal data or secret files into that folder. Again, double-click on the batch file. Type Y and press Enter. The folder will be hidden from view. 1) To re-view your folder, double-click on the batch file. 2) Enter password as “www.top-password.com” without quotes and press Enter key. This is also the default password. Your folder will be visible again. The overall usability of this trick can be improved by deleting the batch file after hiding your folder and re-creating it when you wish to access your folder again. If you face any problem using this trick, you can write a comment and I will do my best to help you. Note: This works on Windows 7, Windows XP and Vista. First try this on useless data to be sure and then only hide your personal data. If you need a more secure and reliable method to protect your private data, please refer to our product – Protect My Folders. Lost your product key somewhere but now you have to reformat Windows 7 system and you cant find the box that contain the key. 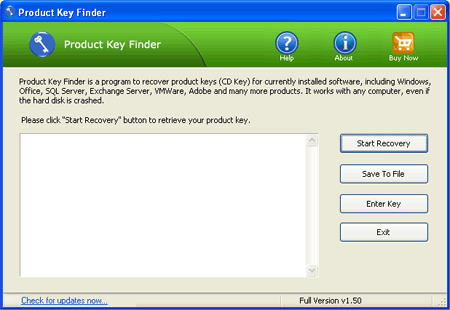 How to recover lost product keys on Windows 7? The product keys of installed Windows programs will lost after reinstalling the operating system or in the event of a system crash. So you’ll know the importance of performing regular backups to save your product keys in case of a system failure. Launch the Product Key Finder program. Click the Start Recovery button, it will bring up a drop-down menu that provides three recovery mode: From current system,From non-booting system and From remote computer. Select the From current system mode from the drop-down menu. This program will automatically scan your Windows 7 system for product keys. Quickly recover and display product keys for Windows 7, Office, Adobe Photoshop, Adobe Reader, SQL Server, VMware Workstation, MS Exchange and and many other software products installed in your Windows 7 system. Click the Save To File button to backup all of the recovered product keys to a safe place, or even print it out so all of your Windows 7 product keys are available on one sheet of paper. Something that most of us will do in our computing lives is accidentally deleting files. Sometimes people will empty the recycle bin without checking its contents, press SHIFT+DELETE on a file or folder (which deletes it without going to the recycle bin) or delete a file or folder from the command line. All of these operations will make the file or folder disappear in Windows and is seemingly lost forever. Luckily for us nothing is ever really deleted on your computer unless something else takes place on the hard drive; Chances are that your files are recoverable. Today we look at Restoration, a free tool that helps you restore accidentally deleted files. It is effective at recovering deleted files and it doesn’t require any sort of installation so you can store it on a USB drive if you like. Click here to download a copy of Restoration. 1) To use Restoration, simply choose the Hard Drive which your deleted file was originally on from the drop-down list in the upper right. For example, I want to recover the file F:\test.txt that I just deleted by press SHIFT+DELETE, so I will choose F: drive. 2) Click the Search Deleted File button, the program will scan the target hard drive for deleted files. 3) When the scanning procedure is complete, it will show a list of files that are recoverable. 4) Click the Restore By Copying button to restore the files. Be sure to restore them to another partition or drive to avoid the risk of overwriting the original information you are trying to recover. This method solves all file loss problems – recovering files emptied from Recycle Bin, formatted hard drive or lost partition and other unknown reasons under Windows 2000 / XP / 2003 / Vista / 2008 / 7.
iTunes is a great piece of software for anyone that likes music. Even if you don’t have an iPod, it is very useful for organizing your music library and adding to your library by buying new songs at low prices. Of course, you need to have the appropriate account for the iTunes store. If you have an Apple account that you use with iTunes, then you will have to remember your account username and password. The username should just be your email address, but the password has to be created by you. If you forgot your iTunes password, then you will need to go through a short and fairly painless procedure to get it back. In this article we’ll show you two methods to recover lost or forgotten iTunes password. If you forgot your iTunes password, then don’t panic. 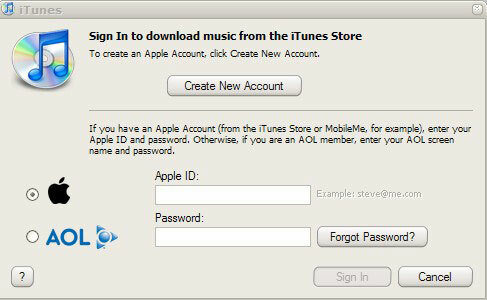 Just launch the iTunes program, click on your username in the top right corner (or the sign in tab if it doesn’t remember you) and then try to sign in. There’s a button to the right of the password field that is labeled “Forgot Password?”. Click on this button to bring up the next screen. This one needs you to enter the username for the related account. As I said, this should just be the relevant email address. Type it in to pull up the next screen that’s specific for your account. You have two options for recovery at this stage. Option 1: If you still have access to the email account, then you can have it just reset the password. iTunes will send a new link to your email address. If you click on the link, it will just reset your password to something new. Use this new password to log into your iTunes account and then bring up your account information again. Change the password to something that you’ll remember and then call it a day. Option 2: If you don’t have access to the email or don’t want to go through the email reset process, you can have it ask you your secret question. It will first ask you to confirm a piece of account information, like your birthday, and then it will give you the secret question that you used when you signed up for the iTunes account. You just have to answer it to get your account back. Hopefully you can remember you secret question. If not, then you’ll need to use the iTunes. Nearly most Web browsers have a pretty nifty password manager, including Internet Explorer, Firefox, Chrome, Safari, Opera. When you log into iTune account from the iTunes Store, the Web browser offers to save your user name and password. The next time you visit that page, user name and password fields are auto completed for you. A real time-saver. But have you ever forgotten your iTune password and need to recover the password saved in your browser? Once you have let your web browser remembers your password, it’s quite easy to recover the password with Password Recovery Bundle. Let’s take the example of Firefox browser. 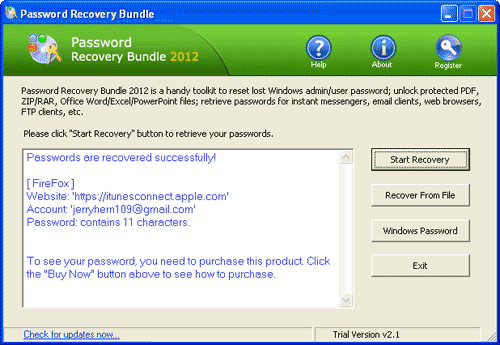 1) Download and install Password Recovery Bundle. 2) Run Password Recovery Bundle, then click the Start Recovery button. It will bring up a drop-down menu that shows all supported password types. 3) Select the Firefox Password option. 4) The program will instantly decrypt the passwords saved in Firefox’s password manager, then display the logins and passwords to all your iTune accounts. If neither of these works, then you will have to call iTunes support to try and find a human who can help you. If you have some other account details, then they might be able to help. Hopefully these instructions should help anyone who forgot their iTunes password get their account back in order. I have taken this method first because I think this is the most popular method/way of hacking Facebook. I studied various Facebook surveys taken on web about hacking Facebook. The results of these surveys show “Phishing” as the most used method to hack facebook and to note… “Phishing is favorite method of Facebook hackers”. So, friends.. beware of Facebook Phishing. Facebook staff is working hard to avoid these Facebook phishers. Phishing not only allows you to hack Facebook but also almost any email account. You have to only get the trick used to make a phisher, which I think is very easy. I learnt it without any difficulty. But, remember, this is only for educational purpose. I will not extend this topic over here. This is my second favorite, as only thing you have to do is remotely install a keylogger application (if you don’t have any physical access to victim computer). Keylogging becomes more easy if you have physical access to victim computer as only thing you have to do is install a keylogger and direct it to your destination so that it will send all recorded keystrokes to pointed destination. What a keylogger does is it records the keystrokes into a log file and then you can use these logs to get required Facebook password and thus can hack facebook password. If Facebook hacker, by some means, hacks your gmail or yahoo account which you are using as primary email address, then this Facebook hacker can easily hack your Facebook password using “Forgot password” trick. He will simply ask Facebook to send password reset email to your primary email address- which is already hacked. Thus, your Facebook account password will be reset and it will be hacked !!! So, always remember to protect your Facebook primary email address and try to keep unknown or useless mail id as your primary email address So far, i found these Facebook hacking methods as best and working ways to hack Facebook account passwords. I never encourage hacking Facebook or any email account, I just wanna make you aware about Facebook dangers online. I will appreciate your effort if you mention any other Facebook hacking method. I am updating this post with a new method which is being used to hack Facebook accounts, which I think is very effective, Facebook cookie stealing is becoming popular day by day.The cookie which Facebook uses to authenticate it’s users is called “Datr”, If an attacker can get hold of your authentication cookies, All he needs to do is to inject those cookies in his browser and he will gain access to your account.